ductus arterio´sus a fetal blood vessel that joins the aorta and pulmonary artery. ductus de´ferens the excretory duct of the testis, which joins the excretory duct of the seminal vesicle to form the ejaculatory duct; called also vas deferens. patent ductus arteriosus see patent ductus arteriosus. ductus veno´sus a major blood channel that develops through the embryonic liver from the left umbilical vein to the inferior vena cava. A tubular structure giving exit to the secretion of a gland or organ, capable of conducting fluid. /duc·tus/ (duk´tus) pl. duc´tus [L.] duct. ductus arterio´sus a fetal blood vessel that joins the descending aorta and left pulmonary artery. ductus chole´dochus common bile duct. ductus de´ferens the excretory duct of the testis which joins the excretory duct of the seminal vesicle to form the ejaculatory duct. patent ductus arteriosus (PDA) abnormal persistence of an open lumen in the ductus arteriosus after birth, flow being from the aorta to the pulmonary artery and thus recirculating arterial blood through the lungs. the Latin term for duct. A tubular structure giving exit to the secretion of a gland, or conducting any fluid. The blood vessel that joins the pulmonary artery and the aorta. When the ductus does not close at birth, it causes a type of congenital heart disease called patent ductus arteriosus. Tubular structure giving exit to secretion of a gland or organ. a fetal blood vessel that joins the aorta and pulmonary artery. Abnormal persistence of an open lumen after birth results in a patent ductus arteriosus. Called also persistent or patent ductus arteriosus. 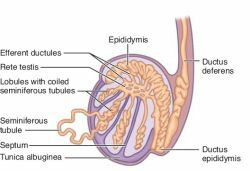 the excretory duct of the testis, which in horses and ruminants joins the excretory duct of the seminal vesicle to form the ejaculatory duct; called also vas deferens. the duct which, in combination with connective tissue and muscle, forms the head, body and tail of the epididymis and continues as the ductus deferens. the joining channel between the cochlea and sacculus of the membranous labyrinth of the inner ear. a major blood channel that develops through the embryonic liver from the left umbilical vein to the caudal vena cava and closes within a few days after birth. If it remains patent, a congenital portacaval anastamosis is created. El analisis de la velocimetria Doppler del ductus venosus demostro onda A reversa en 4 gestantes (2%), de las cuales 3 presentaron alteraciones cromosomicas. 4,9-13) La identificacion in vivo de la falla cardiaca puede ser por medio del ultrasonido doppler que revela la presencia de un flujo anormal durante la contraccion auricular en el ductus venoso (DV) entre las 11 y 14 semanas. Segun Sosa y Diaz (2000), en ausencia de movimientos respiratorios fetales, las velocidades de flujo, tanto en la arteria pulmonar como en el ductus arterioso, experimentan muy pocos cambios a lo largo del embarazo; esto no sucede con los indicadores de la impedancia vascular, los cuales demuestran una reorientacion del flujo de la arteria pulmonar mas hacia sus ramas que hacia el ductus en aquellos embarazos a termino, mientras que en los de pretermino la orientacion es opuesta. Data Ductus is a world-leading provider of network and service orchestration and automation solutions based on best of breed products. Comparisons were conducted in the ventricular septal defect, atrial septal defect, patent ductus arteriosus, tetralogy of Fallot, and overall cardiovascular malformations subgroups because they consisted of relatively large sample sizes. Results: Successful closure of the ductus was achieved in all the cases. Results: In 13 of 174 cases, Doppler studies indicated a reversed a-wave in the ductus venosus. Data of 250 patients who underwent patent ductus arteriosus (PDA) closure either surgical or trans-catheter closure using SHSMA Occluder having weight >5 kg from April 2012 to October 2015 were included in this study. After a detailed fetal ultrasound was performed, the patient was found to have right atrial enlargement, cardiomegaly, tricuspid regurgitation, ductus venosus agenesis, hyperdynamic flow in the umbilical vein, and chorioangioma. My commitment further than here - I plan to fundraise boundaries thousands Mary To add to her charity coffers, Mary recently took to the track once again at the Great Midlands Fun Run alongside her friend, Sharon Moore, whose god-daughter received treatment at the hospital for Patent Ductus Arteriosus - a heart defect whereby there is a persistent opening between two major blood vessels, causing blood to flow in the wrong direction. Nursing chief turns Minion to raise funds for her hospital; BIRMINGHAM CHILDREN'S HOSPITAL HAS THOUSANDS OF SUPPORTERS AND FUNDRAISERS. EACH WEEK WE TELL THE STORY OF ONE OF THE HOSPITAL'S DEDICATED CHARITY CHAMPIONS.. Most of the unborn baby's blood bypasses the lungs via a short, broad blood vessel called the ductus arteriosus. Moreover, the baby suffered from a heart problem called Patent Ductus Arteriosus (PDA), which meant that the open hole in her heart was not closed naturally by the third or fourth day of life.